We were staying in chalets at Ranohira in the Parc National de l’Isalo. Christophe drove us to the Parc’s administrative office where John and I paid our admission fee and paid the Parc’s guide to take us on the short walk, aimed mainly at seeing a family of Ring-tailed Lemurs. We walked to a semi permanent tent camp where guides were busy preparing a cooked breakfast (or was it lunch) for the tourist guests. 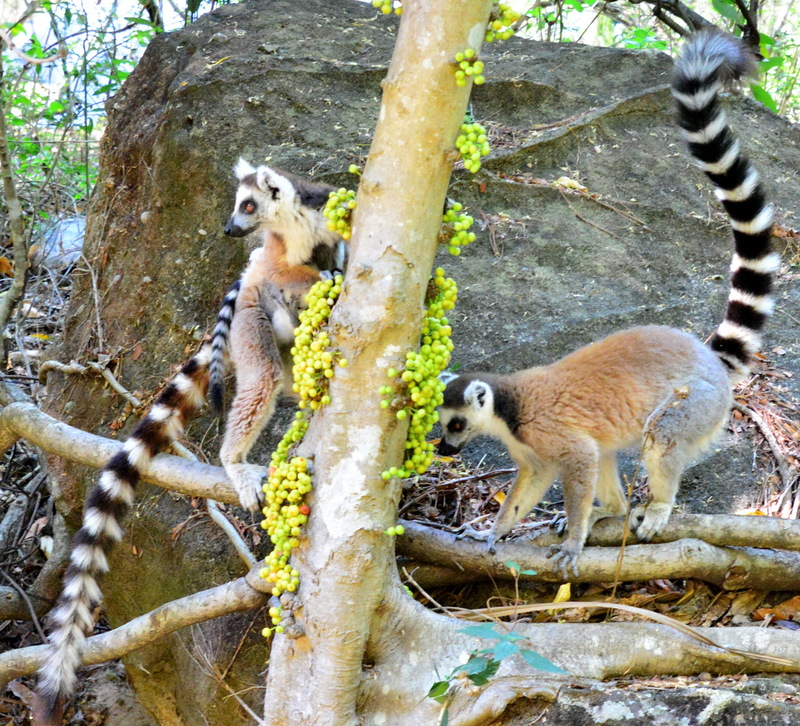 We turned down the offer of a bite to eat, but did enjoy a cold Coca Cola while waiting for the lemurs. Our guide assured us that they would e here in around 15 minutes, as though, like trains and busses, they ran to a time-table. He kept disappearing, listening for their calls to announce their imminent arrival and sure enough, after some 20 minutes, they ‘arrived’. They were outside the camp, in the trees and difficult to catch on camera due to tree stems, branches and twigs and shooting against the sun, resulting only in silhouettes. After a while they came down and made there way to a small stream, with John and me in hot pursuit. It appeared that they spent most of the day higher up (and cooler) in the hills but came down at regular times to drink from the stream. There were Ficus trees growing along the stream with their peculiar fruits that come from the stems rather than from branches and twigs as expected from other flowering trees. I found myself an excellent spot and caught some excellent shots of the first family until they disappeared as quickly as they had arrived, to make room for a second family group, again of some ten to twelve individuals, with young, that made for the Ficus trees farther along the stream. I remembered my slogan ‘if it moves, film it’ and switched my cameras to movie mode, catching some great footage that will become part of next year’s presentations. 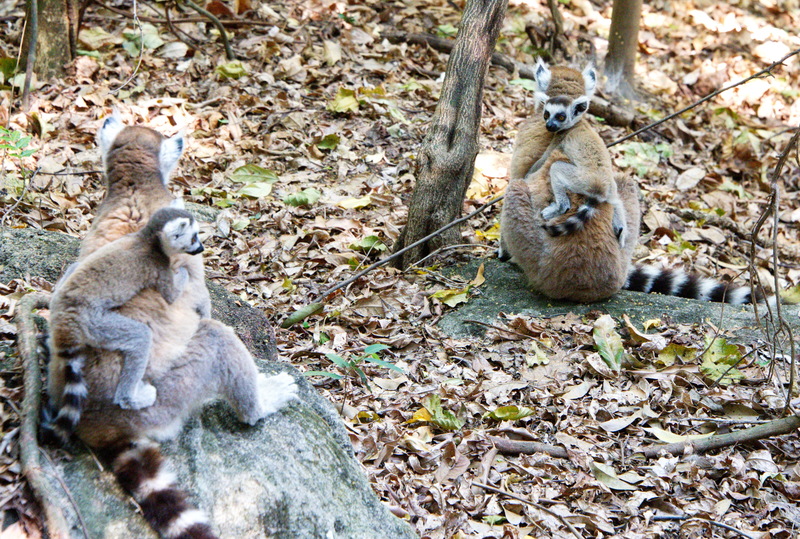 Ring-tailed lemurs with young. Why do they always turn their back on me? … because they were looking for food! Ficus fruits. 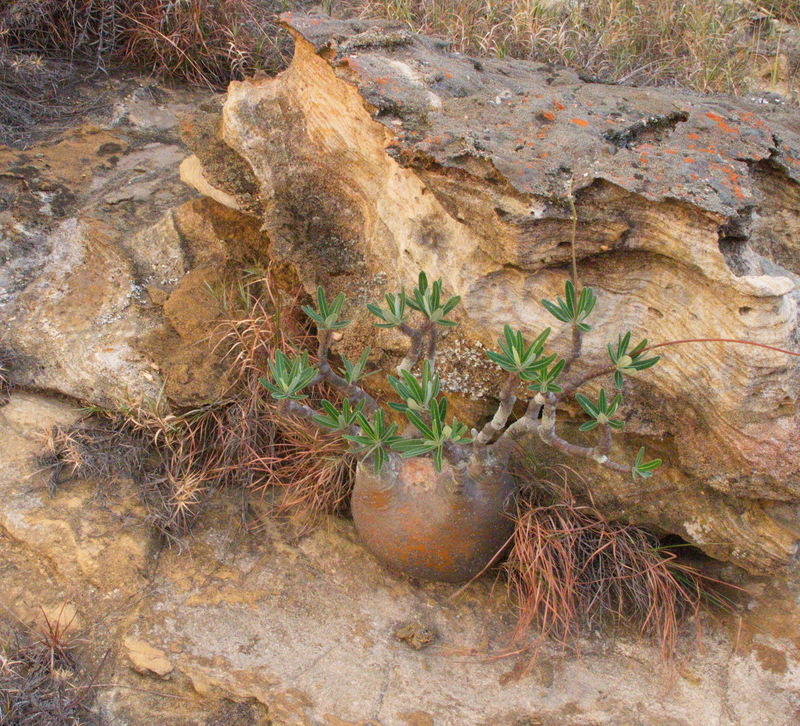 We may have taken too long over lunch as we met up again with our guide for a drive through the Parc to look around at the rock formations with a short walk for a group of Pachypodium densiflorum. One of my problems is that I have been rather spoilt on scenery by walks in many US National Parks, in Brazil, Peru, Bolivia, Chile and NW Argentina. Yep – I’ve seen hills and mountains. Sorry to sound like a spoilt kid! I guess that partly depends on when it last had a drink and how much they drank. Or are you confusing it with P. geayi, which is fatter.